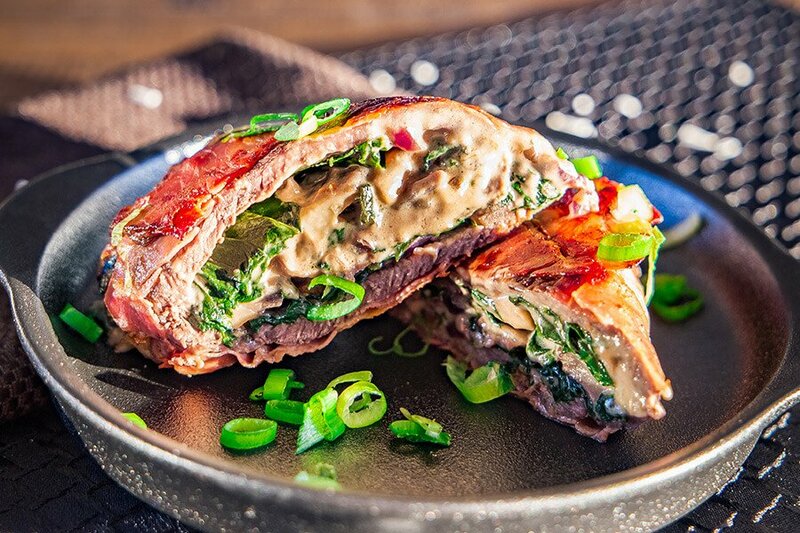 These stuffed beef rolls are wrapped in prosciutto and stuffed with mushrooms, onions, spinach, cream cheese and other cheeses. They are crispy on the outside and gooey in the middle. I have used beef schnitzel to make these but you could use any steak that is big enough like flank steak. Just cut it thinly and pound until about ½ to a ¼ inch thick. 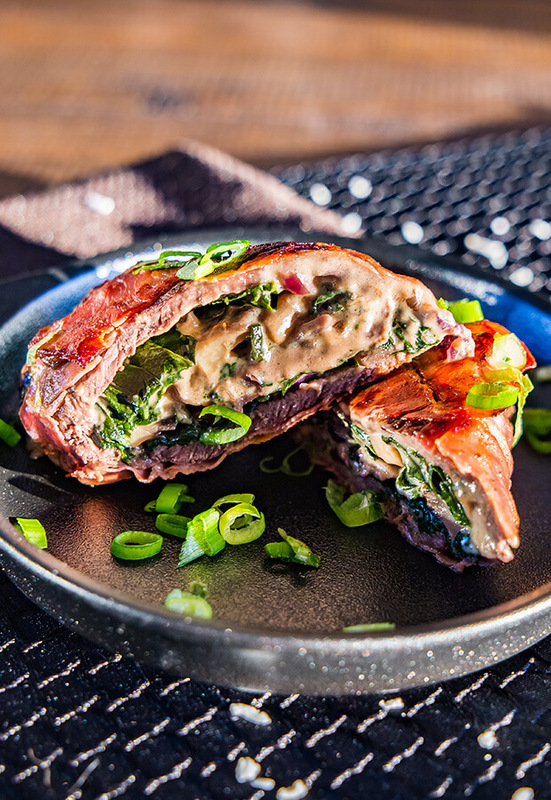 You can also try this recipe using different fillings like sundried tomato, spinach and cheese, or feta, spinach and walnut. If you are watching your calories you can also make this without the prosciutto. 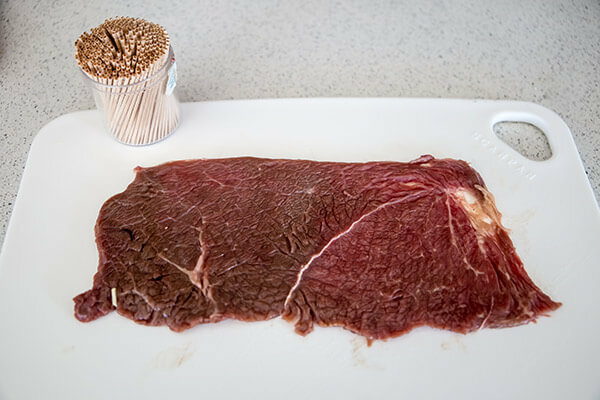 Just truss tie the beef or use toothpicks to secure and fry the same way. If you like beef olives I urge you to give this a try. Serve it with your favorite keto gravy if you like. There are no fancy ingredients or equipment required to make this so whether you’re a kitchen whiz or not these can easily be whipped up for dinner. I like to make a couple and have one for lunch the next day as well. You can also make this recipe easily to feed a family. I have used a few different cheeses as I love the different flavors and textures. You can try these using any cheese of your preference or maybe even just one of the cheeses I have used. The best part about this is you get a decadent cheesy meal and because it’s not too high in calories you still have room for a delicious fat bomb for dessert. *I prefer prosciutto, but you could use bacon instead if you don’t have any. 1. Turn oven to bake at 375ºF to preheat. 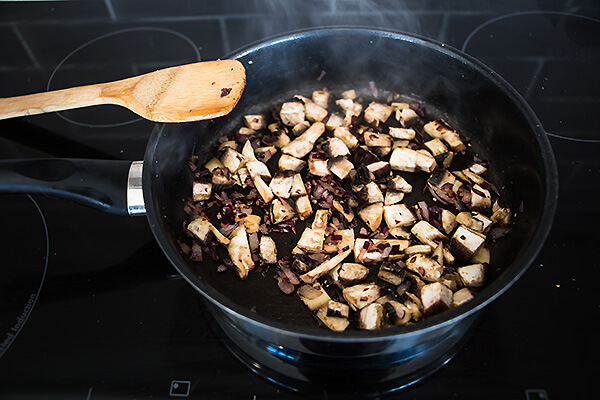 Dice onions and mushrooms into small bite sized pieces. 2. Heat a pan over medium heat to melt half your butter then add your minced garlic. Fry for a couple of minutes then add the onion. 3. 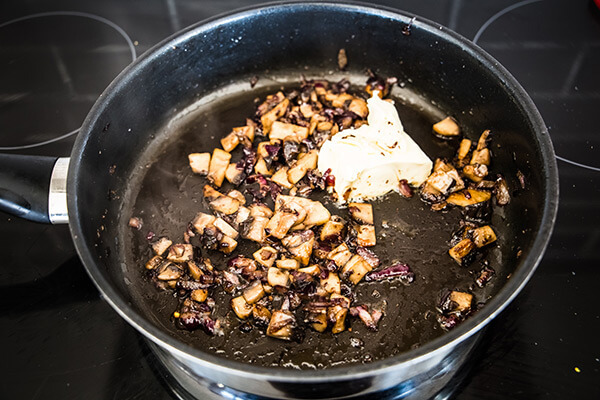 Sautee onions until they are translucent then add your diced mushrooms to the pan. 4. Cook down for approximately 20 minutes until well caramelized and browned. 5. Add cream cheese and mix through the vegetables until melted. 6. Add the three cheeses to the pan and allow to melt while mixing into the mixture. 7. Once the cheese has melted, add the spinach and allow this to wilt and combine with the stuffing mix well. Once done, remove from heat and allow to cool briefly. 8. Ensure you have already prepared your beef if you need to. 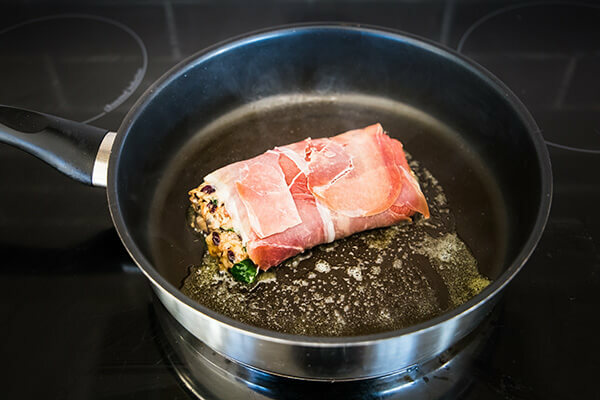 Lay your prosciutto (or bacon) flat on a chopping board overlapping itself slightly and place the beef schnitzel over the top. 9. Evenly spread your stuffing mixture onto the beef so it covers the schnitzel. Leave the edges free to prevent stuffing from spilling over the edges. 10. 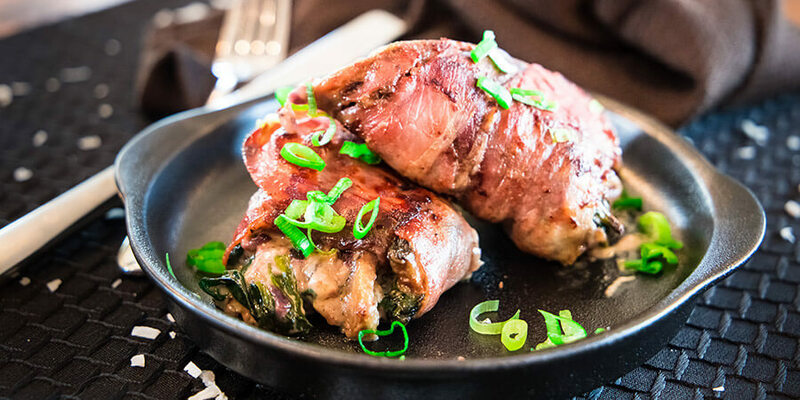 Roll your stuffed beef up using the bacon or prosciutto. If you need to, secure with toothpicks. 11. Melt remaining butter in a pan over medium heat and place your beef roll in the pan to brown. Keep turning until evenly browned then remove and place into your preheated oven. 12. 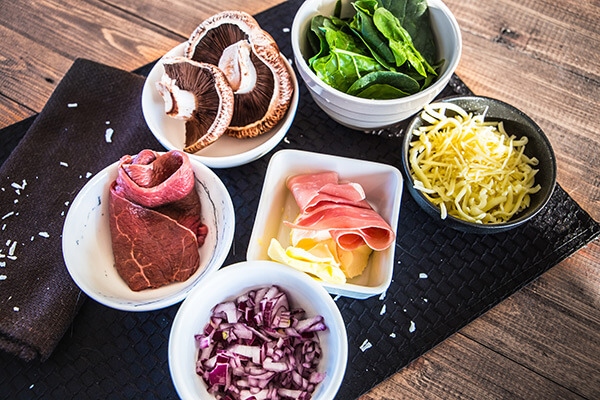 Cook for approximately 15-20 minutes until beef has cooked through. This makes a total of 2 servings of Stuffed Beef Rolls. Each serving comes out to be 423.5 Calories, 31.79g Fats, 5.63g Net Carbs, and 25.39g Protein. Turn oven to bake at 375ºF to preheat. Dice onions and mushrooms into small bite sized pieces. 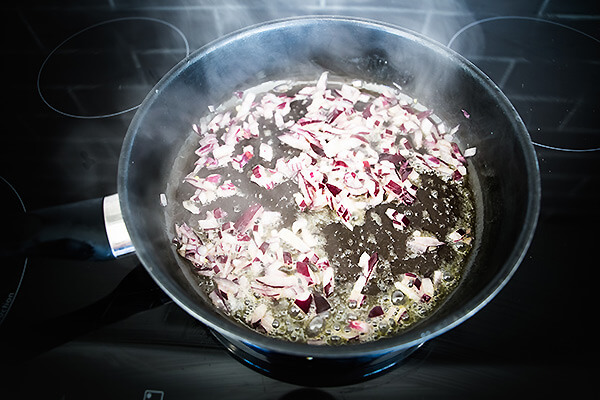 Heat a pan over medium heat to melt half your butter then add your minced garlic. Fry for a couple of minutes then add the onion. 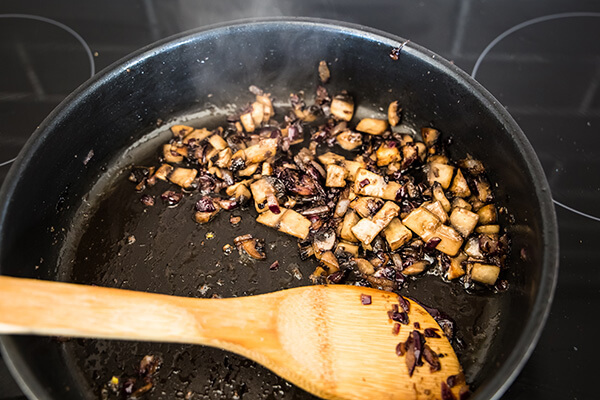 Sautee onions until they are translucent then add your diced mushrooms to the pan. Cook down for approximately 20 minutes until well caramelized and browned. Add cream cheese and mix through the vegetables until melted. 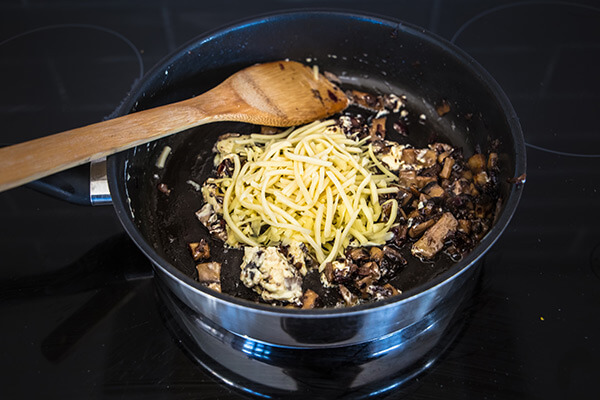 Add the three cheeses to the pan and allow to melt while mixing into the mixture. 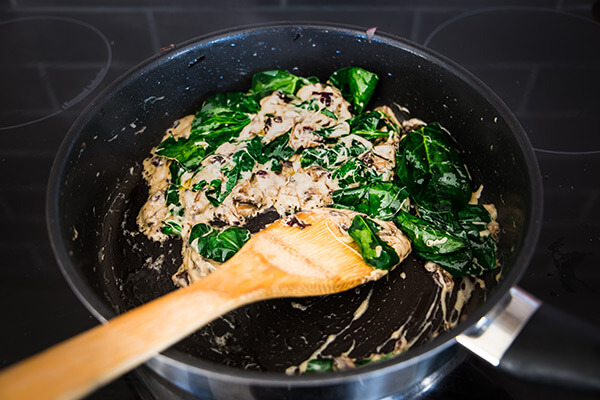 Once the cheese has melted, add the spinach and allow this to wilt and combine with the stuffing mix well. Once done, remove from heat and allow to cool briefly. Ensure you have already prepared your beef if you need to. 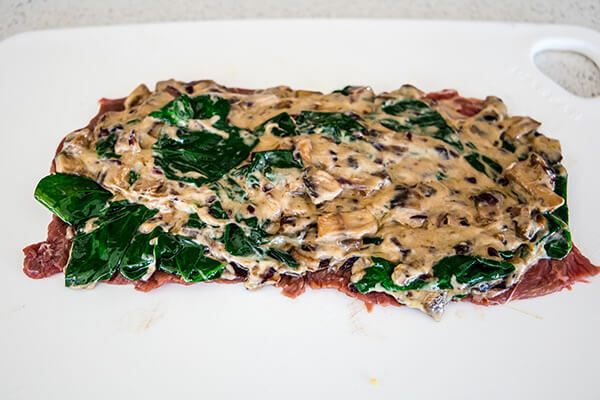 Lay your prosciutto (or bacon) flat on a chopping board overlapping itself slightly and place the beef schnitzel over the top. Evenly spread your stuffing mixture onto the beef so it covers the schnitzel. Leave the edges free to prevent stuffing from spilling over the edges. 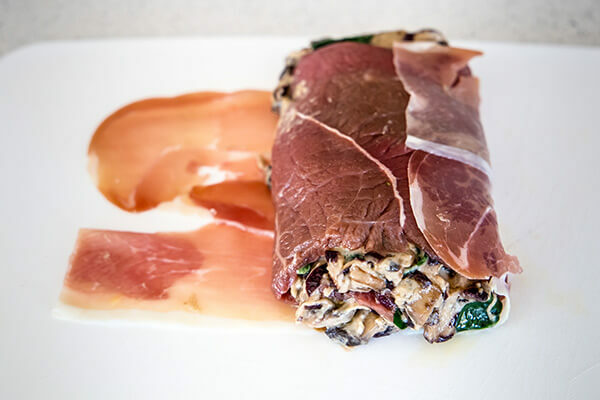 Roll your stuffed beef up using the bacon or prosciutto. If you need to, secure with toothpicks. Melt remaining butter in a pan over medium heat and place your beef roll in the pan to brown. Keep turning until evenly browned then remove and place into your preheated oven. Cook for approximately 15-20 minutes until beef has cooked through.